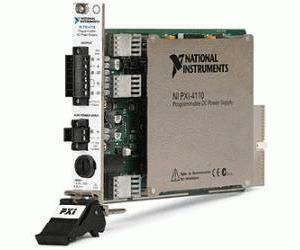 The National Instruments PXI-4110 is a programmable, triple-output precision DC power supply in a single-slot, 3U PXI module. The NI PXI-4110 has two isolated channels, one from 0 to +20 V and the other from 0 to -20 V, and a single nonisolated 0 to 6 V supply, all capable of outputting up to 1 A per channel. The PXI-4110 has 16-bit resolution for programming the voltage set point and current limit and for using the voltage and current readback/measurement functionality. The versatile supply rails and high accuracy make the PXI-4110 an excellent general-purpose, single-quadrant power supply for design validation and manufacturing test applications. To achieve the full 46 W output power, the NI APS-4100 auxiliary power source is required.